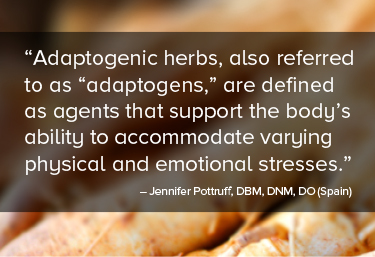 Adaptogenic herbs, also referred to as “adaptogens,” are defined as agents that support the body’s ability to accommodate varying physical and emotional stresses. How many times can you think of a point in your life where you could use that? (for example, stress at work, family stress, and physical stress on your body.) Is this something that could really be out there, easily accessible to us all? Currently people use caffeine for this same effect. People drink multiple cups of coffee each day to give them a lift when they get tired. Some people drink soda. However, these choices tend to end with a crash. Adaptogens are herbs that have been used for thousands of years in both Chinese medicine and Ayurvedic medicine where they are the basis of preventative approaches. These herbs are used to support one’s energy and better handle stress. Adaptogens were at one time, and still are by some, called tonics. Although tonics have a general effect on the entire body, they also have specific effects on certain systems as well. For example, there are heart tonics, nervine tonics, digestive tonics, and tonics for the glandular system. Adaptogens may be considered regulators and they support the stress response system*. In doing so, they help to modify and regulate hormone production and flow*. Examples of adaptogens include Ginseng (Panax ginseng), Eleuthercoccus senticoccus, borage, ashwagandha, wild yam, and licorice root*. Eleutherococcus senticoccus is similar in adaptogen activity to Ginseng. * It is also used to support stress and energy. * Athletes may use it to support performance, although evidence is weak for this purpose. * It has been used in Russia by soldiers, athletes, miners, and deep-sea divers. Adaptogens can be used as singles or in combination formulas depending upon the use. They are favorites among many herbalists to include in many different approaches to client’s goals. In many ways this is influenced by client’s constitution, the practitioner’s experiences, and an understanding of how certain systems of the body interact with one another. Herbalism, while developing as a scientific discipline, retains many of the artisan approaches of its roots, pun intended. Jennifer Pottruff has been in the healthcare field, both conventional and natural, for over 13 years. She is a Certified Doctor of Natural Medicine, Medical Herbalist, and Osteopathic Manual Practitioner. Having started in the conventional field as a Pharmacy Technician, she was drawn to the natural side of healthcare. Jennifer has a family and enjoys teaching herbal medicine. 1. Boon, Heather, Michael Smith, Heather Boon, and Heather Boon. 55 Most Common Medicinal Herbs: The Complete Natural Medicine Guide. Toronto: R. Rose, 2009. Print. 88-94, 240-258, 293-300, 391-394. 2. Steel, Susannah. Home Herbal: Cook, Brew & Blend Your Own Herbs. New York: DK, 2011. Print. 34-35, 62, 88, 135. 3. Hoffman, David. Holistic Herbal: Complete Illustrated Guide. London: Element, 2002. Print. 70, 86, 88, 99, 118.